One of the most noble and wise Jedi, Qui-Gon Jinn was considered a maverick by his peers but was much beloved by those who knew him. Many Jedi thought he could have been a part of the Jedi Council, had he not disregarded its codes and proclamations. Qui-Gon was strongly connected with the living force and could not ignore its influence on him. He deeply respected all living things. He was so attuned to the force that he often took long meditation journeys, going far beyond other masters ventured. He was greatly added by most jedi who knew him. However, Qui-Gon's early career involved a failure with a padawan name Xanatos. The padawan was strong with the force but was too ambitious and impatient. Xanatos ended up leaving the Jedi Order to join his father Crion in a planetary civil war. The circumstances brought Qui-Gon and Crion together, but during a battle Jinn was forced to kill him. Xanatos then furiously attacked his master and then fled into the galaxy, disappearing. Xanatos later returned with a secret plan to trap Qui-Gon and his padawan Obi-Wan Kenobi. Xanatos failed after the two ecaped and Xanatos fled away again. This left Qui-Gon despondent about his ability as a teacher. He had trouble accepting another padawan, Obi-Wan Kenobi, but soon they became as close as father and son. The two went on many adventures together and when they stumbled upon a young slave boy on Tatooine, he believed it was the will of the force that had brought them together and he believed he had discovered the chosen one. Despite his wisdom and great fighting skill, in the end he was cut down by Sith Lord Darth Maul during the Battle of Naboo. Obi-Wan Kenobi avenged his death and granted Qui-Gon's wish just before his death: To train Anakin Skywalker. 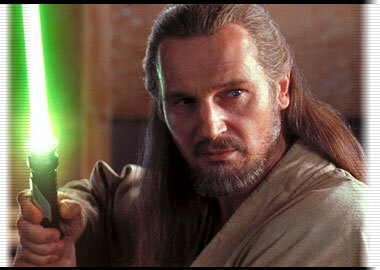 Qui-Gon's voice was later heard ten years later when he had become one of the force. Anakin had returned to Tatooine in attempt to rescue his mother. Anakin was too late, and as he gave in to his anger, he killed the whole encampment of Tusken Raiders who killed his mother. As Anakin began to attack them, he heard Qui-Gon's voice warning him to stop. Master Yoda also heard his voice while meditating, but couldn't think much of it during all the hectic events leading up to the Battle of Geonosis.